Stone of the Northeast Circle. 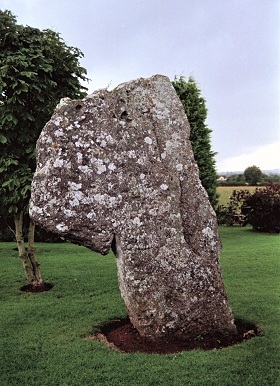 Stanton Drew is a complex and baffling arrangement consisting of three stone circles, two avenues, and a cove. Add to this the nearby recumbent stone known as Hautville's Quoit and you have a site that is as impressive as it is unknown and secluded. Until recently only two of the circles were accessible, now all three are open for the public to wander round and try to make some kind of sense of the monument. A leaflet is available at the entrance to the field that holds the Great Circle and the Northeast Circle, but adds little to the visitors understanding as you walk between sometimes massive blocks of sandstone, breccia and limestone, some standing, some seemingly strewn around randomly. Only on reading and rereading of various texts does the whole picture start to come together. Starting in this large field we first find the Great Circle. A massive 113 metre true circle, it is smaller only than Avebury and contained around 30 stones of which 27 remain with only a handful still standing. Leading from the north east of the circle is the shattered remains of a stone avenue which passes by the smaller Northeast circle. Adjacent to the Great Circle, the Northeast Circle is in fact slightly elliptical and contains 8 stones, 4 still standing. What at first appears to be just a jumble of blocks to the east of this much smaller 30 metre ring is in fact a second avenue, which joins the first and together they would have continued down to the river Chew. Beyond the river, some 350 metres from the Great Circle lies the fallen sarsen block of Hautvilles Quoit. Standing a short distance away from these circles in a different field is the now accessible Southwest Circle containing 11 of a possible 12 original stones. On the other side of the village, between the church and the Druid's Arms Inn is the mysterious Cove, this comprises of two massive standing stones, one looking like a huge Neolithic golf flag and a third recumbent slab lying between them. What makes this site even more interesting is that there are two different alignments here. The first is through the centres of the Southwest and Great Circle onto Hautville's Quoit, the second is through the Cove and the Great and Northeast Circles. Sites like Stanton Drew always attract their share of legends and stories. It is said that the stone circles are a petrified wedding party who danced on into the Sabbath due to the mischievous Devil's fiddle playing. The bride, groom and parson tried to escape but they too were turned to stone, and now stand as the Cove. 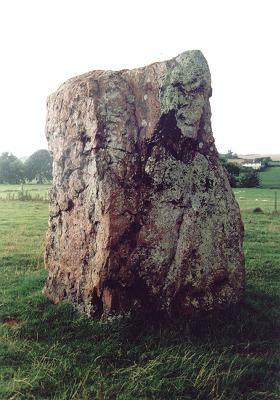 This story is similar to many other associated with circles and standing stones throughout the country, and like other sites, the stones of Stanton Drew are said to be uncountable.